This topic contains a high level and non-exhaustive list of new features added to QGroundControl since the last stable release. These features are available in daily builds. You can now specify a save path which QGC will use as the default location to save files such as Parameters, Telemetry or Mission to. 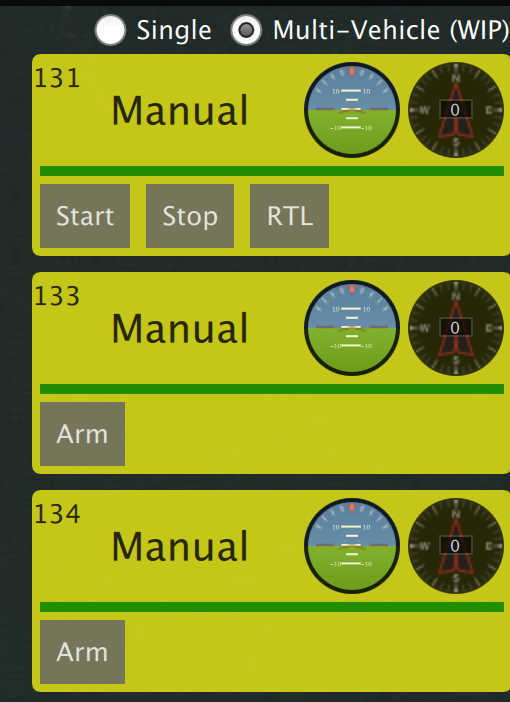 If you have Save telemetry log after each flight turned on you will no longer be prompted as to where to save the log each time the vehicle disarms. They will automatically be saved to the save path specified in Settings. When this settings is turned on when QGC connects to a vehicle it will automatically upload a mission to the vehicle. The mission file must be named "AutoLoad#.mission" where the # is replaced with the vehicle id. The location of the mission file is in the file save path as specified above. When planning a mission the first item in the mission list on the right of the screen is Mission Settings. This allows you to specify your planned home positions as well as specify vehicle information associated with the planned mission. When you add the first new waypoint to a mission the altitude for that item was previously hardcoded to 50 meters. You can now choose a default value for that from Mission Settings. If you update this value while you have a mission loaded it will prompt you to update all the your waypoints to this new altitude. If you change the altitude on a waypoint, subsequent items will continue to use that new altitude. This is an existing feature that has not changed. That new altitude entered from he Plan view does not affect the default altitude stored in settings. This allows you to set the flight speed for the mission to be different than the default mission speed. When planning a mission the firmware being run on the vehicle as well as the vehicle type must be known in order for QGroundControl to show you the mission items appropriate for you vehicle. If you are planning a mission while you are connected to your vehicle the Firmware and Vehicle Type will be determined from the vehicle connection. If you are planning a mission while not connected to a vehicle you will need to specify this information yourself. The additional value which can be specified when planning a mission is the vehicle flight speed. By specifying this value total mission or survey times can be approximated. The planned home position allows you to simulate the vehicle&apos;s home position while planning a mission. This way you see that waypoint trajectory for your vehicle from takeoff to mission completion. Keep in mind that this is the "planned" home position and you should place it where you plan to start the vehicle from. The actual home position of a vehicle is set by the vehicle itself when arming. There is a camera section available (as described above) on each waypoint. You can also adjust the flight speed with each waypoint. If you specify gimbal yaw changes on waypoints both the plan and fly views will show you a visual representation of the gimbal direction. Fixed Wing Landing (new) - Allows you to set up a fixed wing landing pattern with a loiter to a specified altitude followed by a landing. Images are automatically not taken in the turnaround zone outside of the polygonal survey area. There is a new Hover and Capture option which can be used to capture the highest quality image at each image location. The vehicle will stop at each image location prior to taking the image such that the vehicle is stable while the image is taken. There is a new option to re-fly the survey grid at a 90 degree angle to the previous pass. This allows you to generate much denser coverage for the images. You will be prompted to remove the mission from the vehicle after the mission completes and the vehicle lands and disarms. This is meant to prevent issues where stale missions are unknowingly left on a vehicle cause unexpected behavior. Flight time is now available for display in the instrument panel. For new users, fligth time will be shown by defeault. For existing users who have already modified their instrument panel values you will have to add it yourself if you want to use it. New Mavlink Console which provides access the the nsh shell running on the vehicle. There is a new view available when you have multiple vehicles connected to QGC. It will only show up when more than one vehicle is connected. When that happens you will see an additional set of radio button at the top right of the Plan view. Take Control back of the vehicle by returning to manual control from a mission. Each vehicle connected to QGC must have a unique id. Otherwise QGC will think the vehicles are actually the same vehicle. The symptom of this is the Plan view jerking around as it tries to position itself to one vehicle and then the next. For PX4 Pro firmwares this is the MAV_SYS_ID parameter. For ArduPilot firmwares it is the SYSID_THISMAV parameter. Standard QGC supports multiple firmware types and multiple vehicle types. There is now support in QGC which allows a third-party to create their own custom version of QGC which is targeted specifically to their custom vehicle.